.....is about nature and creativity, natural flavours blended with pure cocoa beans for moments of pleasure.This bar collection contains 4 bars; 30% (cocoa content) white chocolate with Lemon & Poppy seed, 37% milk chocolate with Sicilian Hazelnut & Almond, 58% fine dark chocolate with Orange & Thyme (vegan), 70% extra dark chocolate with Chilli & Lime (vegan). 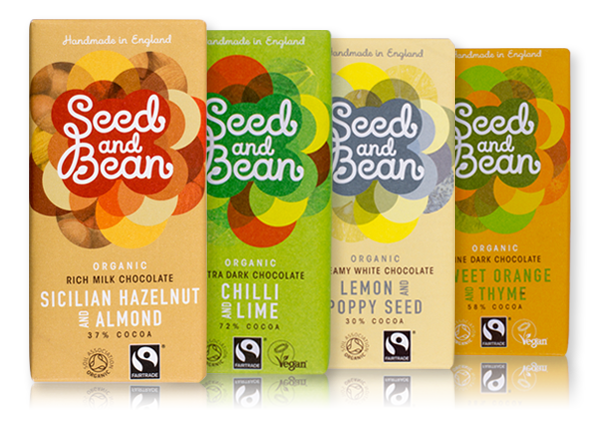 Seed and Bean is 100% organic; their products are ethically sourced and all of their chocolate bars are handmade in England. Markedly different. Choosing our Seed & Bean chocolate bar collection you will find a variety of flavours that will make your palette dance.